PTFE Teflon® & Kevlar Aramid Corner Packing : PTFE Teflon Graphite Gland Packing, Pure Teflon Packing Manufacturer, PTFE Teflon Gland Packing, PTFE Graphite Packing, Hollow Core Gland Packing. 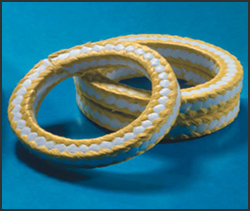 PTFE Aramid is a super combination Cross Braided Packing specially designed with lubricated pure PTFE on the faces and special yellow synthetic fibre filaments on the corners. Due to its multifibre dense and homogeneous construction the packing is most suited to all fluids including corrosive chemicals, even under extremely high pressure conditions. The packing has exceptionally good dimensional stability, creep resistance and non-toxic. The packing will not provide extraneous stresses on plungers which damage both packing and plunger under high pressure conditions. Recommended for use in dairies, foodstuff, beverages, pharmaceutical industries and refineries. A good packing for high pressure pump handling carbonate and ammonia solutions in the fertilizer industry, miscellaneous chemicals in the petrochemical industry, feed water pumps, etc.